Macao evokes a strong sense of connection to a shared colonial heritage because after the Portuguese conquered Malacca in 1511, they sailed to the China coast in 1513 and it was not until 1553, that they started to trade from Macao. When the British established themselves in Hong Kong in the 1870s and began to dominate trade along the China coast, Macao became an outpost for gambling and prostitution run by Chinese gangs. And so it remained Portuguese territory until 1999 when Macao was returned to Chinese sovereignty as a Special Administrative Region. With a wealth of history as a thriving trading post for centuries, Macao is certainly more than the iconic ruins of St Paul’s, casinos and egg tarts. In walking tours dubbed, “Crossroads of China and Portugal,” “Footsteps into the Historic Centre” and “Bygone Days of Taipa Village” I soon discovered Ten Things in Macao that’s not just about culture and heritage but also exciting new attractions for the young and the young-at-heart to enjoy. Look closer at the carvings to see Jesuit images designed with Oriental themes that were carved by Japanese Christians in exile and local craftsmen under the direction of Italian Jesuits. I’m not surprised that even pouring rain does not stop visitors who are keen to see the ruins! Within the 400-year old IACM Building, an administrative building for senatorial meetings, formerly known as the Leal Senando, I find a courtyard garden. The walls extending from the building entrance into the garden are decorated with pretty Portuguese tiles, creating the charming ambience of an 18th century Portuguese mansion. There are two stone spheres, one engraved with the Shield of Portugal while the other symbolises Portuguese discoveries. After a sudden downpour, the garden is wet but beautifully refreshed. The original Lord Stow’s bakery in Coloane village, opened in 1989, is jam-packed with customers but it does not stop me from joining the queue to buy a few boxes of freshly-baked Portuguese egg tarts to share. Created in 1990 by Andrew Stow, an English pharmacist in Macao, his signature recipe of lip-smacking tarts are baked flaky, puff pastry cups filled with smooth egg custard. These Portuguese egg tarts are now synonymous with Macao and visitors simply cannot leave without tasting them! A visit to Macao is not complete without a peek into their casinos. There’s much to marvel at the décor and themes of the casinos situated in the city centre and Cotai Strip, from the iconic Grand Lisboa to the world’s largest casino, The Venetian. By night the building facades are lit up by dazzling neon lights and where the 24-hour open casino-hotels are not linked by covered walkways, there are free shuttle buses to ferry you to the next. Macao is the only place in China where casinos are legal and is positioned ahead of Las Vegas as the world’s largest gaming centre. If these walls could speak, what tales they would tell? This narrow street was once a red light district with opium and gambling dens, and of course, brothels. In the 1940s, the street surface was cobblestones but the buildings’ façade with classic doorframes and lattice windows, remain unchanged since the era when this was where joy-seekers came for a taste of happiness! With its sordid reputation safely in the past, this street continues to be an attraction for its history and nostalgia. The Taipa Municipal Market, fondly called the Red Market due to its red-brick façade, is a popular wet market at Rua Norte do Mercardo Almirante Lacerda bordered by three other streets. This is where you can get a glimpse of the local produce from fresh fish, meat, poultry, vegetables, to dried seafood and sundry goods. In the morning, there is a convivial feel at the stalls set up around the building to sell fruits, flowers and household items and at a street corner, regulars gather to play Chinese chess with a crowd of spectators looking on. Across the road from the Red Market, is Long Wa Tea House, a traditional Cantonese dim sum place. The tea house, established in 1962, has floors covered in small mosaic tiles, a popular trend back in the 60s and business carries on virtually unchanged today. You pick from a choice of quality tea leaves to yum cha the leisurely way the locals do. Here, you help yourself to the selection of dim sum from the steamer while your order for noodles, steamed chicken and freshly sliced char siew or barbecued pork, are served. Have fun posing for photos with hand-painted 3-dimensional paintings and exhibits displayed in more than 150 photo spots across 18,000 sq ft of exhibition space. Here’s where you find the world’s first Michael Jackson exhibition with 3-D artwork to get close to the King of Pop. Enjoy illusion technology and have fun capturing shots in various sections of the exhibition like Macao Journey, Jurassic World, Chinese Culture, Touch of French, Romantic Story and Interactive Experience Zone. A comprehensive collection of exhibits is found in this well preserved Neo-Classical building that was once used as a public administrative building on Rua Correia da Silva in Taipa. Look out for the glass floors which gives visitors a view of the stone architectural structures in the basement, discovered from recent archeological excavations. The upper floor has exhibits on the life and industry on the islands, fishing, agriculture, ship-building and the fireworks factories that were once important here. Closed on Monday and free admission on Sunday while entry fee is MOP5 on other days. The City of Dreams offers a unique and exclusive experience at the world’s largest and most spectacular water-based show, House of Dancing Water. It’s a jaw-dropping award-winning, live show presented by a cast of about 80 international performing artists in a purpose-built round theatre around a central stage which converts from an aquatic to solid floor stage in moments! Get ready to be wowed by live music, high-divers, a contortionist, an amazing giraffe and roaring motorbikes! Since the extraordinary series of events that took place on January 14, time seemed to have stood still in our home. The page for January 14 which was not torn off! As the family rallied around to see to dad’s needs while he was in hospital, we only realised late one night, days later, that the daily tear-off calendar at home was not torn off since that morning. Tearing off one page of this calendar per day was among dad’s morning routine activities like picking up the delivered newspapers from the front porch, turning off the night lights and taking the butter out from the refrigerator so that it was soft enough to spread at breakfast. The sight of this traditional calendar, still on January 14, was both poignant and painful because we know that our home would never be the same again after dad’s peaceful passing on January 17. While his presence is deeply missed, we are at peace knowing he’s safe in the arms of Jesus and we have a treasure trove of good memories with him. My brother and sister-in-law had the privilege of staying overnight with dad in the hospital – one night in the general ward and another, in the first class ward – where dad was transferred after two nights in the general ward. When I brought dad’s shaver to the hospital, my brother helped to give dad a shave. Dad always had a shave in the morning and sometimes also in the evening, if we were going for a special event. I knew personal grooming was important to dad and I never saw dad looking unshaven or ever keeping a moustache. While my brother and his wife went home to get some sleep, my mum, aunt and I took the day shift. As dad rested quietly, his breathing seemed to be more labored. I took my time to talk to dad, recounting in chronological order, from the time we left home to go to consult Dr Yap at KPJ Puteri Hospital for his shingles problem. I told him he was then resting in the first class ward of Hospital Sultanah Aminah, his entitlement as a special grade retired government servant, and the doctors were taking good care of him. I was with dad in the first 24-hours since he suffered an acute stroke and I observed his confusion about what was happening to him. But after 24-hours, his condition had stabilised and he seemed to have a sense of what was going on. I was deeply encouraged when I saw that each time I paused, dad moved his head with imperceptible nods. I just needed to tell dad what had transpired between that time when we left home to our walk together to the pharmacy until when he was lying, almost immobile on a bed. It was also an opportunity to tell dad that we loved him very much and reassured him of what we were doing to keep him comfortable. Dad often talked to us about medical procedures and when we lived next door to the government clinic in Masai for the 13 years dad was based there, we learnt a great deal more about health care through dad’s patient experiences. So while dad was lying inert on that hospital bed, I could tell him about the Ryles tube that was being used to feed him and I was sure he understood what had happened to him and would cooperate with the doctors, nurses and other carers. That afternoon, around 3.45pm when the nurse came to check dad’s blood pressure, the reading was so shockingly high that we asked if the apparatus was malfunctioning. When the doctors came to verify dad’s condition, they confirmed that dad had expired after a sudden cardiac arrest. Dad passed on so peacefully that it seemed that someone had just turned off a switch and he ceased to breathe. Through modern technology, news of dad’s passing spread rapidly but it failed to reach visitors who were already in the hospital compound, making their way to the ward to see dad. They were probably more shocked to discover that dad had expired moments before their arrival! Our lives are certainly not in our hands. And even though we long for more time with our loved ones, it is beyond our ability to keep them when God calls them to their eternal rest. In the 2-night wake for dad, our family was comforted by relatives, the church and friends who expressed their support and condolences through messages, food, gifts and wreaths, and being with us during our time of bereavement. It was most reassuring to learn that our sister in the UK managed to change her flight and she arrived on time for the second wake service, and dad’s children were together for his send-off the next day. Our nephews and nieces in the UK and Australia could not come on such short notice but we were reassured that they were with us in spirit and through the use of modern technology. My tech-savvy nephews shared some of my blog posts on dad and reading them again brought on fresh tears because it reminded me that dad was indeed a very special father, grandfather and great-grandfather. I simply choked up with emotion at their thoughts posted with Instagram photos selected from our family album. A friend who was at the wake, told me she follows my family stories in My Johor Stories and felt our loss like she was part of the family! We deeply appreciate the loving support from everyone who came from near and far, especially those who travelled from Kuala Lumpur and Singapore. From the tributes and messages, it was encouraging and comforting to see how my dad, a simple man who grew up in Ipoh’s Elim Gospel Hall, had impacted so many people during his journey here. Surrounded by the love and support from family and friends, the wake period passed swiftly and smoothly. We had to eat to keep up our strength and in honour of dad’s memory, we chose to eat food he enjoyed, like the Teochew recipe soup noodles with fish slices by Leong Kee. And for lunch the next day, we had takeaways of mushroom soup and grilled chicken sandwiches by Niniq Bistro. Later we also had a Village Countryside dosai meal in dad’s memory. “Uncle was an inspiration to me because he never stopped learning. I was both shocked and somewhat bemused to see him learning to play the piano when he was in his 70’s. He was always keeping active, always yearning to know more and pushing himself to achieve more. He also read widely and kept his mind alert with Word Search games. And then he took up learning to read and write Tamil! I believe that through this and God’s grace, he remained mentally sharp until the end. I’ve also learnt a great deal about uncle’s faith. The two key attributes/characteristics/values that I took from his life are prayer and legacy. Prayer, because he knew that if his heart’s desire was aligned with His, then there was no need to worry because His will, will be done. Legacy, because what better legacy to leave than an entire family who knows the one true Saviour and are saved for eternity. I will cherish this for the rest of my life as it brings new meaning to the material things we strive for day in and day out. Lastly, and the main point – your dad’s sacrifices and love for family! He will remain the uncle I’m most grateful to because he opened his home to our grandmother for two decades. Uncle Steven is a very close second if not tied. Each time I think of this, my heart aches but I know your dad is being richly rewarded right now. I’m so grateful for his love for gran. I know she was not the easiest to live with but somehow uncle made it look easy! For the wake, we chose to use a vintage studio shot of dad taken in the 1950’s. When he went out, dad always made sure he had a folded handkerchief in his pocket and often added a splash of cologne. So we dressed him simply but smartly in the outfit he wore at our nephew’s orange-colour themed wedding, complete with handkerchief in his breast pocket and a spritz of cologne. It really didn’t matter what dad’s age was in that old photo because in our hearts, he would always be our loving daddy, smart and handsome, sometimes serious but mostly jovial and always caring and considerate. We love and miss you dearly daddy, until we meet again on that beautiful shore. I’m writing this from the side of a hospital bed with my dad lying on it. It’s 2am when they finally settled him and turned down the lights in the men’s ward. A symphony of snores surround me as patients rest for the night. Recently, dad was showing symptoms like loss of appetite and at breakfast, he could not even finish the sandwich that he spread for himself. He told me that he felt nauseous if he tried to eat more. A day before, dad failed to finish his portion of lunch and dinner, setting his plate aside with a sigh. He told me that he could no longer enjoy food now. So there was no point in taking him out to eat because he couldn’t chew and enjoy his food anymore. But dad said he could still enjoy the mushroom soup and grilled chicken sandwich at Niniq, a bistro where we dine regularly. I reminded him about the soft dosai that he liked and he agreed that yes, maybe that too. Then when I encouraged him to eat another bite or spoonful, dad gagged with nausea. This morning at breakfast, dad again said he couldn’t finish his meal. I was rather concerned and told him that if such symptoms persists, we have to go to the doctor. When he got up from the table, dad lifted up his singlet and showed me his abdomen that was covered with a band of rash. He said yesterday, when he was drying himself after his shower, he discovered the rough skin surface and realized something was wrong. Mum and I suspected that it was a virus that caused the shingles and this helped me decide not to put off the appointment to consult his doctor. Dad was not reluctant to see the doctor but told me he did not want to be admitted to the ward. I considered his skin infection and assured him that if the doctored wanted to monitor his condition, I would take him to the clinic daily. Dad has a good rapport with Dr Yap and feels comfortable discussing his condition in medical terms with the doctor. I phoned Dr Yap’s clinic at KPJ Puteri Specialist Hospital but the nurse was reluctant to add dad to the list of his patients. She quizzed me if dad had a fever (for a sense of urgency!) but I told her dad was a regular patient and needed to see the doctor today. We agreed for an appointment in the afternoon and I said we would be there after 2pm. As usual, mum and I would accompany dad to Dr Yap’s clinic and after I dropped them off at the porch, I would park and join them at the clinic. We know the good doctor is a popular physician with a queue of patients waiting to consult him, so we were prepared for the wait – which was often rather long. To our surprise, the wait was not long this time and Dr Yap himself opened the door to call dad in! In humour typical of dad, he greeted the doctor in Japanese language. They had a good consultation and the doctor sent us out with the assurance that as dad’s shingles was at an early stage, he should respond better to treatment. Mum and dad with the grand-daughters! We had to wait for the nurse to hand over the prescription and I made dad sit while waiting. Dad, who used to work with the government hospital dispensary, told me that in those days, the hospital would dispense anthisan cream for shingles. He even reminded me to ask the dispenser, when I collected his prescription, for the name of the cream prescribed. In our many visits to the clinic, we have walked this same path to the pharmacy countless times. So with me holding his left arm, I started walking to the pharmacy with dad. He held his walking stick in his right hand while mum was just behind us. As we approached the entrance to the men’s room, I asked dad if he needed to go but he did not reply. Looking back, I guess something was already happening to him because his facial expression was blank – neither yes or no thanks – in response to my question. Dad was always polite, with a habit in saying Thank You even if I handed him a spoon, and it was unlike him to remain silent. By the time we rounded the bend and was walking in front of the dispensary counter with the rows of seats to our right, I noticed that dad’s walking stick was being dragged on the ground. Suddenly dad was keeling over to the right and he was pulling me along! We landed softly on the nearest front row seat and mum’s shouts of alarm attracted the nursing staff who rushed to our aid! Dad’s awkward position plus his height and weight, was a challenge for the nurses to lift him onto a wheelchair to take him to the Emergency Room. After a brief struggle, a stranger who was probably a patient’s family member, came forward to lift dad onto the wheelchair. In the commotion, I could only remember his green colour jersey and the strap of a man-bag across his chest. Whoever you are, sir, thanks very much for not hesitating to lend your strength to help us in lifting my dad. At the ER, the doctor and her team acted quickly and when a nurse from Dr Yap’s clinic who was there, recognized us, I passed her dad’s patient card to ask Dr Yap to come to see dad quickly. And he did. He turned up in a few minutes and when he examined dad, Dr Yap was clearly shocked at the sudden turn of events when he discovered that dad had suffered an acute stroke. It was particularly shocking because only a few minutes ago, the doctor and dad were sharing a good laugh during the consultation in his clinic. Dr Yap advised us to get dad admitted for medical attention but upon checking, found that there were no beds available in the hospital. He suggested alternative hospital options and the ER doctor helped to make the calls to find out the bed availability. While mum and I were in shock, we had to think rationally to make decisions while I kept my siblings updated on the developments. Then I recalled a conversation with dad who told us that in the event of anything happening to him, he wanted to be sent to the JB GH or Hospital Sultanah Aminah (HSA) as it is known now. So while I shuttled between Dr Mazlina and talking to mum and my siblings, we reached the decision to transfer dad to HSA. With the paperwork completed, mum volunteered to ride with dad in the ambulance while I went home to pick up dad’s records at HSA. A few years ago, even after dad had his angiogram done by Dr Yap, dad preferred to have his his angioplasty done in HSA. It made sense for dad to have his follow-up treatments with the HSA specialists clinic and Mahmoodiah outpatient clinic because he was a former staff of the JB GH. Our ordeal at the HSA Accident & Emergency ward was expected to be long but we never anticipated the hours we had to spend just waiting. The A & E of a public hospital such as HSA was the very place to see the true colours of Malaysia because all races of citizens affected by various ailments, were seeking treatment here. Mum and I are ever grateful for the gentle and frank opinions of Dr Hakim and Dr Tee who gave us reassurance and advice on dad’s condition. Later, much later, when dad was finally ferried to the men’s ward at almost midnight, Dr Subhash also dealt professionally with us. After Dr Subhash examined dad, she advised that one of us should stay with him through the night. So here I am, sitting by dad’s bed in HSA, as he rests fitfully. The staff nurse in charge of this section made the prescribed cardio check on dad and fitted a Riles tube for feeding purposes. Then she pulled up a desk next to where I’m sitting to do her paperwork. We shared a quiet camaraderie as she busied herself filling forms in patient files while I recollected my eventful day. In our short snatches of conversation that were punctuated by her getting up to attend to patient needs, I learnt more about Nurse Haliza Isa, who hails from Pahang, and her interests. I smiled when I heard that dad had joined the snoring symphony, glad that he was catching up with some sleep after such an eventful day. It was surreal to think that in a matter of moments, everything changed. Now we have a new chapter ahead as we adjust our lives around dad and his needs. The doctor explained that the prognosis was not good. In medical terms, dad’s conscious level was 9% out of 15% which means that he may never recognise us again. As a result of his acute stroke, not only was his speech impaired, he’s no longer himself. I’m just sad that we may never enjoy dad’s corny jokes and friendly banter, ever again. Daddy, I'll love you forever and no one can ever take your place as the first man in my life. I’m missing you already. You may not recognise me but just as you have always been my strongest supporter, I’m here for you now and for always. In mid-November last year, I had limited internet access while on a road trip around Cape Town, South Africa, so when I checked my mail later, I was shocked to see photos of the flash floods in Johor Baru. The road turned into a river in front of KOMTAR JBCC! It was almost unbelievable but when I recognised familiar buildings on Jalan Wong Ah Fook, I knew it couldn’t be a hoax. Sungai Segget had overflowed and the road was a river that had partially submerged cars in murky brown waters. From a video, I saw workers making futile attempts to build a barricade against water rushing into a basement carpark. Another shocking video featured foreign workers standing in the flood, holding a live fish as long as a man’s arm! While I felt a deep sense of loss and sadness for the properties and businesses affected by the flood, flooding was not uncommon at low-lying areas in the city. 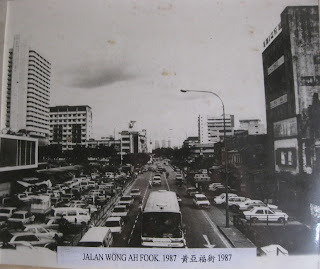 The area around Jalan Meldrum, Jalan Siu Nam, Jalan Siu Koon and Jalan Siu Chin and basement carparks there, were notorious for getting flooded. Many would remember past seasons of super high tides where the water level of the Johor Straits overflowed along the coast onto Jalan Skudai. It was a seasonal phenomenon that amazed the locals but there was never cause for alarm. But the flash flood along Jalan Wong Ah Fook on November 16, especially between Menara Public Bank and Komtar JBCC, was however, unprecedented. 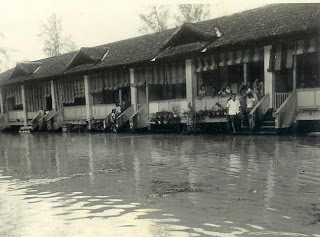 In 1960 when our family lived in the staff quarters at Jalan Dato’ Wilson in the compound of the then Johor Baru General Hospital, an unusually high tide on Christmas Day flooded the entire area. My dad captured photos of guests who arrived for our Christmas party, wading their way through flood waters while kids and great-grandma were ferried to our house by floating on my bath tub! After the November 16 flash floods in the heart of JB, the city suffered yet another smaller flood near Komtar JBCC on Nov 24. By then Majlis Bandaraya JB (MBJB) and the principal coordinating agency responsible for the Sungai Segget project, Iskandar Regional Development Area (IRDA), were better prepared to deal with it. MBJB had also distributed notices to the public warning of super high tides between Nov 24 and 30. MBJB and IRDA are aware that the flash floods were caused by various contributing reasons including continuous heavy rainfall and super high tides. They also agreed that land reclamation work in the Johor Straits may have also affected tidal currents and caused more silting at the river mouth which inadvertently resulted in poorer drainage run-off from Sungai Segget into the Straits. Rapid development within the Central Business District also changed major data like the drainage layout system and catchment volume. From the limited data, it was found that Komtar JBCC is situated in a water sub-catchment area and more prone to flash floods due to its gradient. The area around Jalan Wong Ah Fook has changed dramatically since the 1800s when JB was a free port with a busy harbor for the export of timber and other products extracted from Johor’s forests as well as plantation crops like pepper and gambier, coffee, tea, areca nuts, sago, wood oil, rattan and resins. 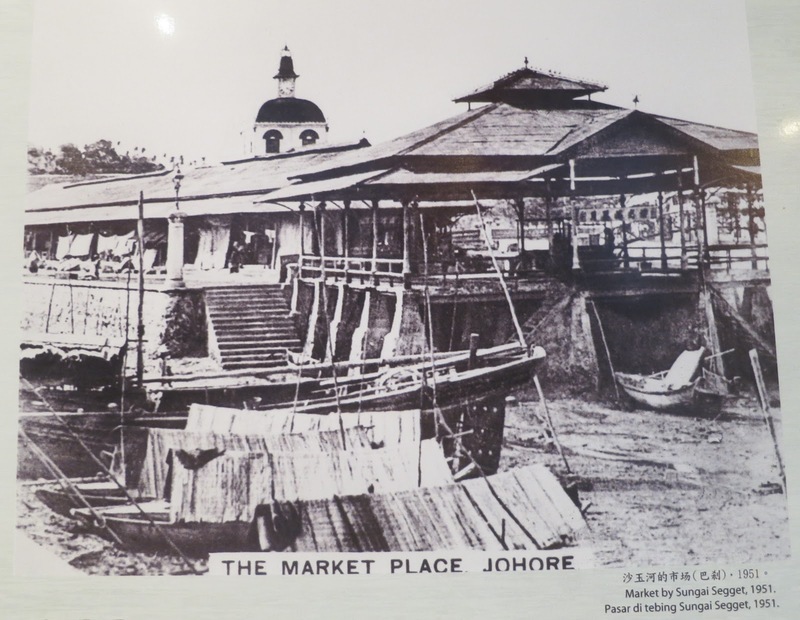 Before the causeway with road and rail links between JB and Singapore was constructed in 1924, Sungai Segget was a major waterway plied by small vessels like sampan and tongkang to ferry goods and people along the river to a site near present day Tropical Inn. To regulate water levels at high tide and to control traffic, a sea-gate or tidal gate was constructed at the river mouth. This tidal gate has been in use for decades and while upgrading work is in progress to improve its functions, additional pumps and a generator are employed to help pump out excess water into the Johor Straits when necessary. I’ve also written about how the name Segget came into being and speculated that locals may have corrupted the pronunciation of sea-gate into “segget” instead! Many people may not remember but the area around Jalan Segget was originally canals around a triangular-shaped island, the site of the wet market where traders sold fresh produce and fishermen brought in their daily catch for sale. The old market was replaced by a new one built with wrought iron in 1894 and later, the canals were reclaimed and built-up as Jalan Segget. At the corner of Jalan Ungku Puan and Jalan Wong Ah Fook, on a site bordering Sungai Segget, there was a Food Market that the Teochew fondly call, pasar kia or small market, renowned as a food court for a range of popular street food. The river was then conveniently used for waste disposal where all manner of waste was dumped and when the tide was low, it was an open sewer that emitted a distinctive stinky pong! Sungai Segget was then the bane of our developing town and it was a relief when this Food Market was closed and the pollution to the river ceased. The river, which runs parallel with Jalan Wong Ah Fook, was later completely covered and landscaped with pedestrian paths until 2014, when work started on the project to reopen the river. With such a long and eventful history, Sungai Segget certainly deserves to be the crux of the RM240 million upgrading project that includes the construction of the Sungai Segget Water Treatment Plant, flood mitigation and beautification of Jalan Wong Ah Fook. This project is one of the initiatives of IRDA under the JB Transformation Programme that aims to sustain the city as the capital of Johor by providing economic activities, city living and amenities that are aligned with the vision of MBJB and Iskandar Malaysia. I simply can’t wait for June 2016 when the project will be completed and the landscape around Jalan Wong Ah Fook will be transformed beyond recognition. Meanwhile let’s be patient while remaining vigilant as the monsoon season will soon pass and the project, which is on track, will be completed according to schedule. My relationship with Lego started way back when I played it with my younger brother and watched him build extraordinary structures from his collection of Lego bricks. Many years have passed since we played with the set that dad bought us and a generation later, Lego continued to give hours of fun to my nephews who also played with these versatile bricks. Through the years, never in my wildest dreams did I imagine that one day in the future, Lego would build a Legoland, right here in Johor Baru! In 2009, I was among those who witnessed the ground-breaking ceremony by the then Johor Menteri Besar that kicked off the construction of the theme park in Medini, Iskandar Malaysia. Then in 2012, a day before Legoland Malaysia Resort was opened to the public, I joined a media tour to experience the park for the very first time. Since then, I have been to the park regularly for media events that launched new exhibits and festive celebrations. Each time I go to these events, I would tell my family that I’m off to Legoland. They must have heard this line much too often because I try to attend media invites whenever possible so that I can share updates about new attractions and happenings in the park. Last year, I was at the park to witness the launch of the lunar new year attractions like counting the number of mandarin oranges made of Lego bricks, the Star Wars exhibit, the Ninjago, Realm of Shadows, live puppet show, and when the Johor Sultan personally launched the miniature Lego replica of Istana Bukit Serene at Miniland. As I watched the park develop from a brown field into an international destination for local and foreign tourists, I felt that the time was ripe to share the park experience with my family. Every time I had a work assignment there, they may hear me saying that I’m off to Legoland but this time, I would like to bring them along! most photographed spots in the park! When the year-end holidays were just ahead, I arranged for a date where my brother and his family would join my elder sister and me, to bring our parents to the park. I was particularly keen to let mum and dad see what was going on inside the park because each time we drove pass (usually on our way to a seafood dinner in Gelang Patah!) I would point out to them, the Legoland Malaysia site. This is a familiar area for dad because, he was once based in Gelang Patah for work at the government dispensary. 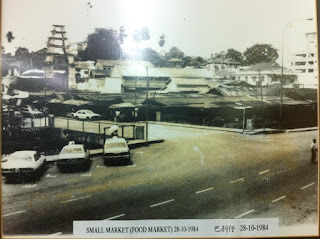 He had staff quarters inside the dispensary and as it was then quite a distance between JB and Gelang Patah by the old road, dad used to stay there and come home only at weekends. On week nights after the dispensary was closed, dad told us how he would partner with the locals to go hunting for wild boar. At that time, dad owned a licensed double-barreled gun and I can still remember the smell of the oil which he used to clean and oil his gun. Dad and his friends would go into the nearby jungles to hunt and I imagined that the sprawling site where Legoland is situated, was probably one of his regular hunting gounds! At 93, dad may not remember exactly where they went hunting back then but he is familiar with the area where Iskandar Puteri is being developed, that was once rubber and oil palm plantations fringed by dense jungle. In the morning of the first weekday after Christmas, I joined the crowd in front of Legoland Malaysia Resort to get my tickets while the family waited patiently in a shady spot. I had also reserved a wheelchair so that we could wheel dad around the park. Then I spotted Casper Bonavent, Legoland Malaysia’s operations director, welcoming visitors to the park that sunny morning. I remember meeting him along with the Master Model Builders, at previous events in the park. While waiting for my turn to be served, we had a chat and he was pleasantly surprised to learn that the first time I was at the park was when it was still a brown field! Look at those two in the front row! The excitement was palpable and rather infectious among both young and not-so-young members of the family, but before anyone got lost in the crowd, I suggested that we study the park map and aimed to visit the various attractions, try the rides, catch the shows and meet back at the entrance later. We had all day but time flies when we were having fun, so we should wisely make the most of the fine weather to enjoy the park. Just as we entered the park, I was amused to see what our family Maybank-ers were doing. My brother and sister-in-law, who work with the bank, could not resist posing for a shot with the Lego version of the Maybank mascot tiger dressed in armour! While we headed to the Lego City Stage for the Ninjago show, the youngsters left the seniors to explore the park on their own and enjoy as many of the park attractions as possible. Meanwhile, we took turns at pushing dad on his wheelies and it was good that the Legoland Express train ride even had a dedicated section for wheelchair riders. At Dino Island, I pushed my dad up the viewing ramp to watch my brother and his wife ride the boat into the mountain and roll down the chute with a big splash! They came out dripping wet but it was also an opportunity to see if their quick-dry matching T-shirts were as effective as they claimed to be. By the time we had explored and admired the iconic structures designed in Miniland, their clothes were dry again and my brother, a Star Wars fan, was ever so keen to head into the Star Wars exhibit. We saw that a storm was brewing and when the monsoon rain came down in torrents, we were comfortably indoors, sipping hot coffee and nibbling cake. In fact, we enjoyed two meals in the park, lunch at the Market Restaurant and later, afternoon tea at The Café. This was where the youngsters found us after they enjoyed fun rides and watching the 4-D Lego Movie. The rain had abated somewhat before we braved the wet and wheeled dad out again. It was still drizzling but dad was a good sport to hold the umbrella over himself while my brother wheeled him out! It was a thoroughly enjoyable outing where the youngsters explored the attractions and thrilled to the rides while the seniors had a good experience of what the park has to offer. So when I next tell the family that I’m off to Legoland, I’m sure they now have a clearer picture of where I was going and why. Over and above that, I just appreciate the privilege to share the Legoland experience with my family and to make more memories with them!